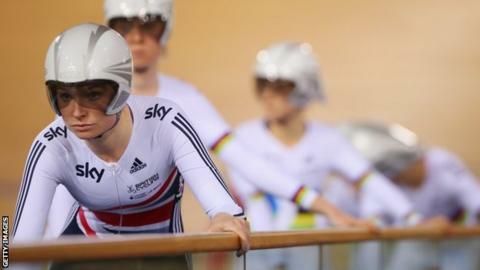 Welsh cyclist Ciara Horne says there is "fierce competition" to be selected in Great Britain's team pursuit line-up for the 2016 Rio Olympics. Horne, 26, has been named in the five-strong squad for the final round of the UCI Track Cycling World Cup in Hong Kong (16-17 January). Thirteen cyclists are in contention to make the team for Rio and Horne says she is determined not to miss out. "We're all doing everything we can to make that line up," she said. "It's fierce competition and it's what pushes us all on. We've got eight academy girls and five podium girls so there's a lot of competition for those spots. "That is what makes the GB teams one of the best in world." Horne was part of the GB team that won bronze in the opening leg of the World Cup series in Columbia in October. They were effectively down to three members for the final race because Elinor Barker was ill. Rules dictated Barker had to start the race, but she immediately left the track once the action began. The 21-year-old from Cardiff will be alongside Horne again in Hong Kong, with Laura Trott, Joanna Rowsell Shand and Emily Nelson, another Welsh rider, completing the line up. It will be their final race before March's World Championships in London, and Horne knows the pressure is on to retain her place in the team as Rio approaches. "Olympic selection means the absolute world to me," she said. "That is what's pushing me day in day out to do all the little things right so I stand the best shot of making that team. "It I don't I can look back and know I did absolutely everything I could and I'll have no regrets."